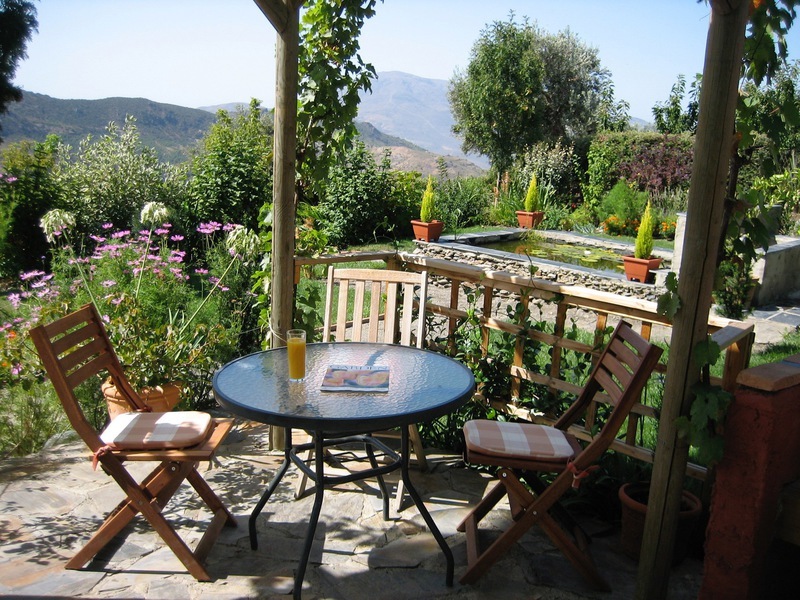 El Lujar - a charming garden apartment provides accommodation for two people in one double bedroom. Wifi available - no charge. 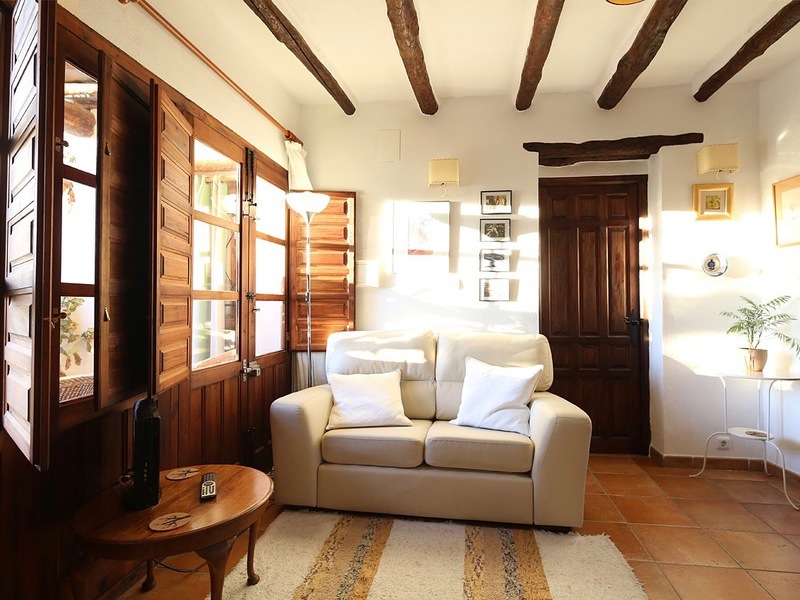 This well equipped apartment has two sets of french windows leading from a private courtyard patio into the light and airy open plan living area of El Lujar. Here you will find a comfortable two seater sofa, large dining table and chairs, side table, coffee table, book shelf and log burning stove. There is a television that receives Spanish TV only, but can also be used to play CDs and DVDs. The kitchen is fitted with cupboards, full sized oven, glass ceramic hob with four rings, overhead extractor fan and full sized fridge. Plates, cutlery etc. are provided for at least four people and there is an extensive range of cooking equipment. 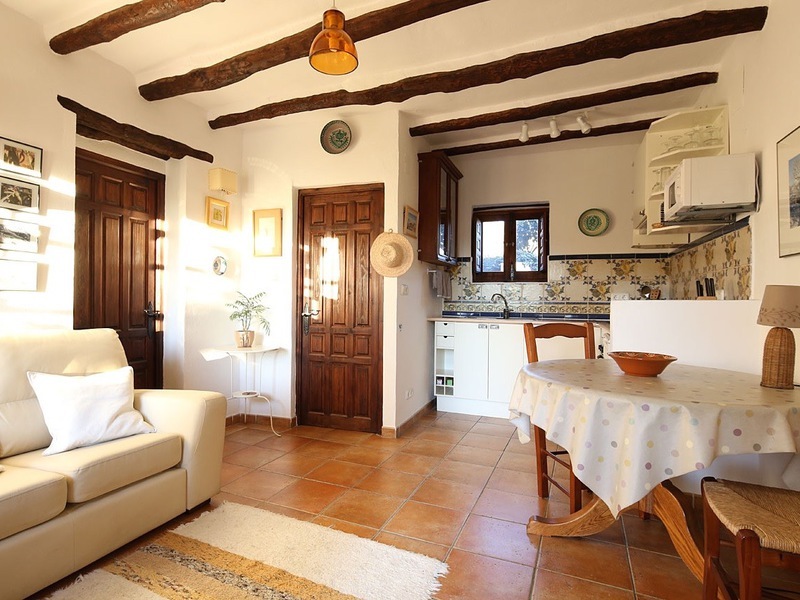 The kitchen is tiled with ceramics in traditional local designs, and is clean and modern. It has a window that faces east and allows the morning light to flood in. Next to the kitchen there is a door leading to the bathroom. This has a sink, W.C. and walk in 'wet room' style shower fitted with a Oxygene power shower. It is fully tiled with shelves, hooks, mirrors, towel rails and a cupboard provided. The bathroom also has an east facing window with frosted glass. From the sitting room a door leads into a good sized bedroom with a double bed (200cms x 150cms), two side tables with lamps, a chest of drawers, a built in wardrobe, a well stocked bookshelf and an armchair. An east facing window looks out onto the surrounding hillside. 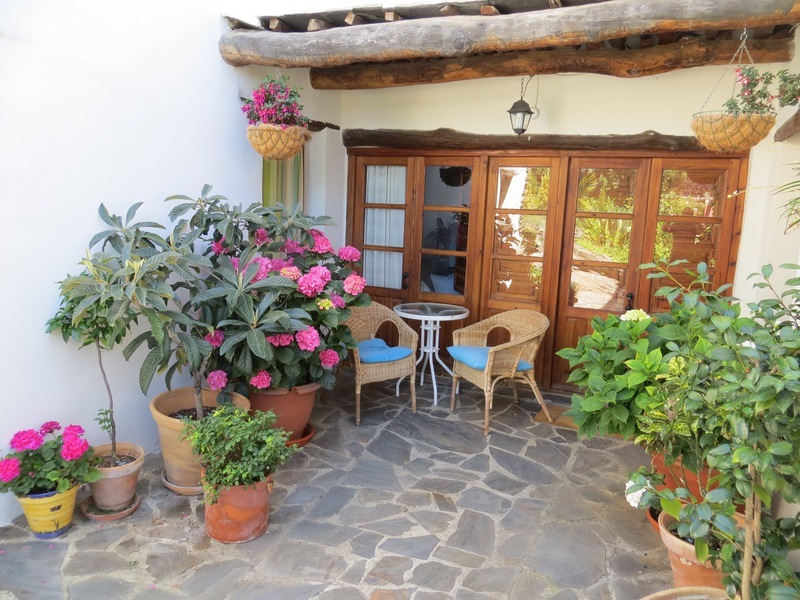 El Lujar has its own private courtyard with flowering potted plants. 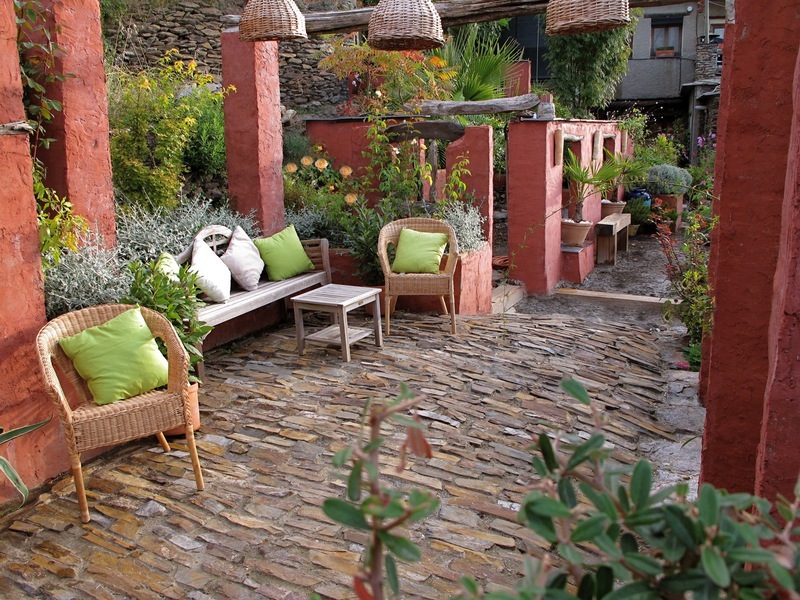 There is a small covered area just outside the door which leads directly onto a patio, part covered by a pergola, which is for the exclusive use of guests staying in El Lujar. 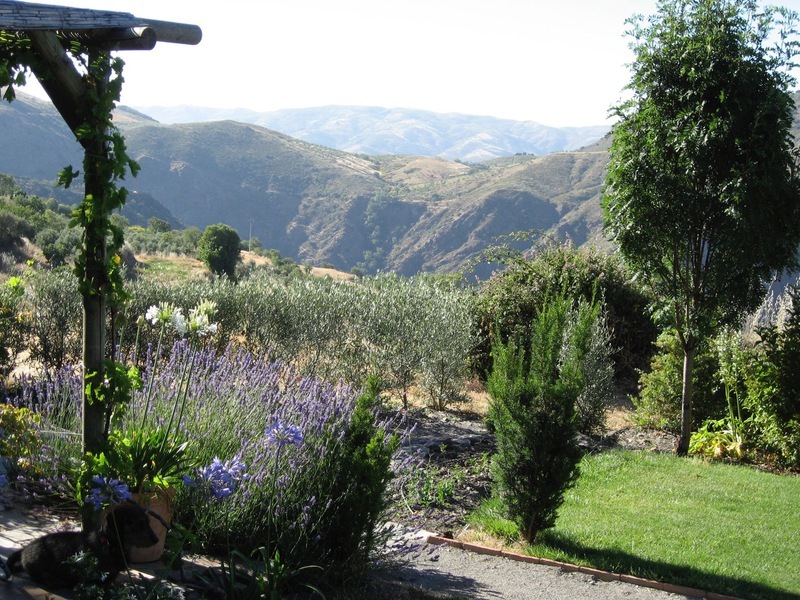 The patio has open views across the garden towards the Rio Bermejo, to the village of Pitres and further to the high summit of El Lujar - on a clear day the Mediterranean sea can be glimpsed way down in the valley. The patio has full sun all day whilst the west facing courtyard offers a perfect location to enjoy the setting sun. Shady areas are provided by a pergola covered in wisteria and grape vines. The private outdoors spaces lead on to the large communal garden where you will be sure to find your favourite, secluded spot. Tables, chairs and sun loungers are provided to allow guests to take full advantage of the outdoor spaces. 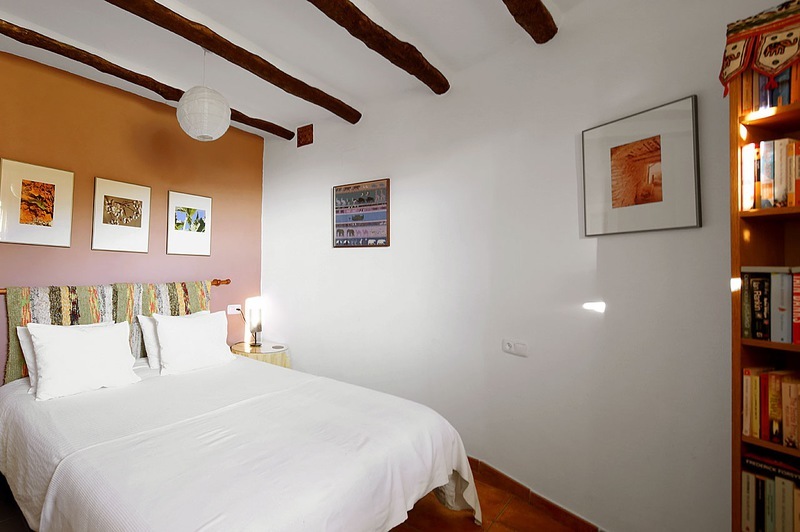 Throughout the accommodation the floors have been finished in warm terracota ceramic tiles. There is an underfloor heating system in all areas, the use of which is included in the rental. During most of the year the days are warm enough for t-shirts and light clothing but since the area is mountainous the evenings and early mornings in the cooler months can be chilly and we have found the heating system invaluable. The log burning stove is provided as an additional cosy luxury, wood can be purchased locally. A baby cot and high chair can usually be supplied if requested in advance. El Lujar is ideal for two people. 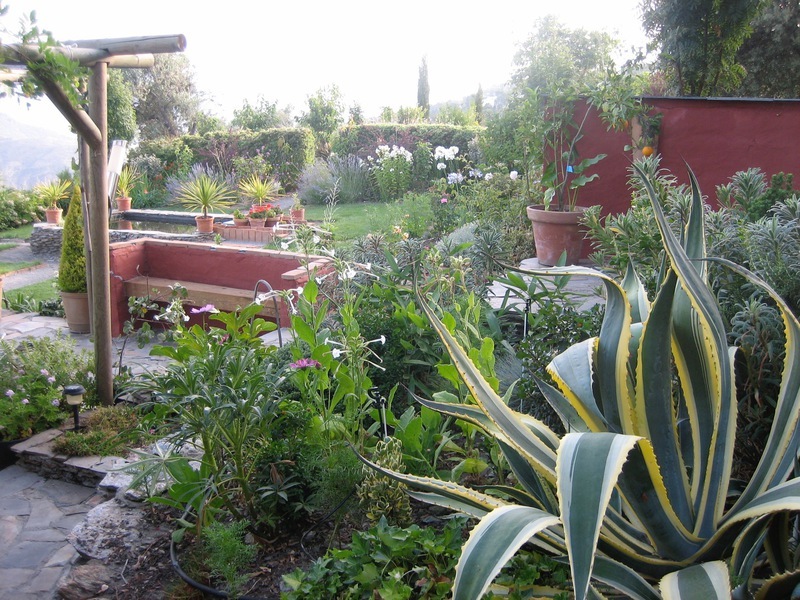 Whilst its overall dimensions are a little smaller than La Corona it has its own charms, it is more connected to the garden and its outdoor space is more sheltered. Adjacent to the courtyard is a guest room with en-suite bathroom and two single beds which can be rented out in addition to accommodate a further two people. 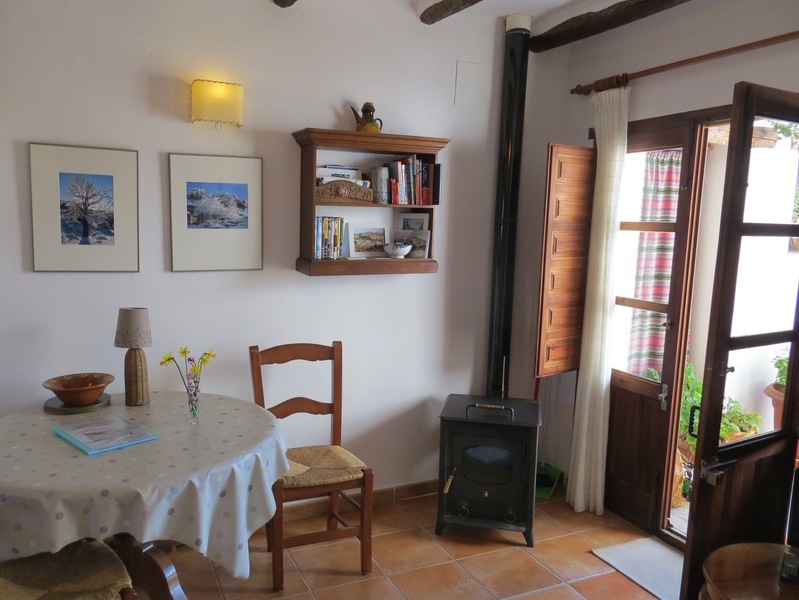 'Guest room', available to rent in addition to El Lujar for a further two people. Wifi available in the apartment, free of charge. All towels and bedding provided, changed weekly. You should bring your own towels for use outside apartment, i.e. for sunbathing, local pool, beach or dipping in mountain streams.